Saint Joseph's Hospital Auxiliary hosted its annual Awards Luncheon at the Dunwoody Country Club, honoring volunteers for surpassing a record-breaking million-plus hours of service since its founding in 1951. During the event, Auxiliary volunteers were also recognized for their years of service, individual service hours and the Volunteer of the Year award. "Our volunteers play a major part in the grace and healing of each patient at Emory Saint Joseph's," said guest speaker Philip Coletti, the chairman of Emory Saint Joseph's Hospital Board of Directors. During his inspirational talk, Coletti recalled the extraordinary care that his wife received at the hospital 20 years ago during quadruple bypass surgery, as well as the care and concern Auxiliary volunteers consistently display toward every patient that enters the doors of the hospital. Through the years, the 400-plus-member organization has served patients and families by supporting the hospital with donations of more than $6 million dollars. These monetary gifts have been used to purchase hospital equipment, furnishings for various areas, Courtesy Carts to transport visitors on campus, the Mobile Mammography Unit and many other items. 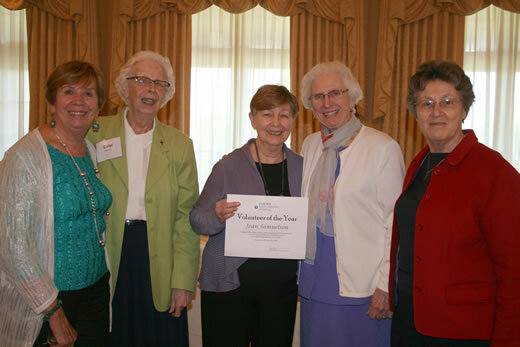 Auxiliary treasurer Jean Samuelson was awarded the Volunteer of the Year for her 16 years of dedicated service to Emory Saint Joseph's Hospital. Samuelson, a past president of the Auxiliary, has volunteered in several areas of the hospital, completed a historical review of Emory Saint Joseph's archives and also launched the Auxiliary alumni group. The Volunteer of the Year was selected based upon the following criteria: support of the hospital and patients consistent with the philosophy of the Sisters of Mercy; bringing comfort and hope to those in distress; commitment to serve the suffering; wisdom and humility in directing efforts to do for others; and demonstrating love, kindness and faith to the community. Last year, Auxiliary members completed more than 59,000 hours of service. Individual service hours ranged from 500 hours to the top category of 22,000 hours, which were completed by volunteer Jo Appleby. During the recognition ceremony, volunteers also celebrated 10, 15 and 20 years of service.